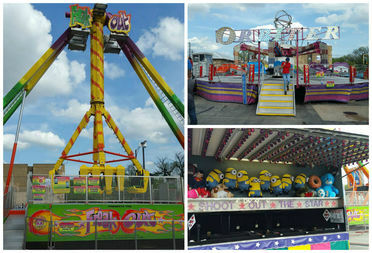 The carnival, which kicked off Thursday at 2622 N. Pulaski Road, goes until Sunday evening. LOGAN SQUARE — Gather your kids and head to the first 31st Ward carnival this weekend, which offers rides, games and all the funnel cake and nachos you can stomach. The carnival, which kicked off at 5 p.m. Thursday at 2622 N. Pulaski Road, will be open from 5-11 p.m. Friday, noon-11 p.m. Saturday and noon-10 p.m. Sunday. According to Ald. Milly Santiago (31st), it's the first carnival of its kind in the ward. “As we have seen the community come together for ward-wide projects like Participatory Budgeting or our recent Know Your Rights workshop, we see lasting links develop which will help solve problems on a local level and make our community stronger," Santiago said in a prepared statement. Santiago will be there manning a community outreach tent. Commissioner Luis Arroyo, Jr. and neighboring Alds. Gilbert Villegas (36th) and Ariel Reboyras (30th) are also expected to attend.